Whenever a report like Hubspot’s State of Inbound comes out, I get all excited. Some data! Some stats! New things to learn! Benchmarks to compare my work with! And this year’s report did not disappoint, either. With 54 pages of data gleaned from thousands of respondents in marketing and sales, Hubspot once again gives us a good overview of the world of inbound marketing, from budgeting to planning to measuring. And since not everyone has the time to read all 54 pages of the report, I’ve pulled my top 5 takeaways to share with you. Any digital marketer worthy of his or her name will tell you that email is still the best and most reliable way to connect with your customers. What's better than getting directly into their computers and phones? Guy Steeves of Constant Contact presented a useful talk about e-newsletter marketing, and why it's still the "sexiest new social media app" (direct quote) around. Here are the highlights of his presentation. When people discuss newsletter analytics, they tend to focus on the open rate. But according to Steeves, it's the click rate that matters. High click rates show that your readers are interested in what you have to say; they are telling you to "show me more". The problem is, how do you get those clicks? How do you engage people with a newsletter so that they will be not only tempted, but compelled to click through? If you're an expert, be of service to people. Help them with questions, problems and issues. People love to get free help, so providing that help through email newsletters is the best way to increase trust and engagement. Bring your expert knowledge to those who need it the most, and they will love you for it. Of course, the point of the newsletter is to get people on your website. This is why you only provide snackable bits of content in the email, and share the rest on your website. Calls to action are the link between your newsletter and your website. Without clear, obvious and urgent calls to action, your readers are not likely to click through your website. Calls to action need to be big and obvious, and normally placed above the fold (i.e. before people need to scroll). Make sure that your calls to action are "thumbable"; that you can click them with a thumb on a smartphone. All your pictures should also be linked to content because they are also easy to click on a smartphone screen. The best calls to action elicit a physical, measurable response. According to Steeves, if you're not measuring, you're not marketing. Keeping track of your opens, clicks and other engagement measures will help you figure out what you're doing right and what you're doing wrong. You should also use your email newsletter to survey your customers at least a few times every year. The surveys don't need to be long–3 to 5 questions–and they can reveal lots of interesting information about your readers that you wouldn't learn otherwise. 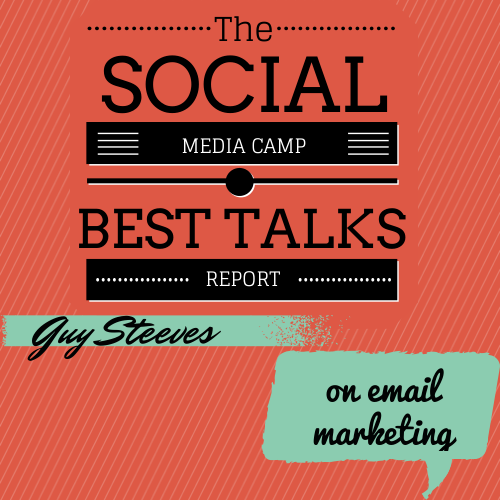 This is Steeves' formula for email marketing: you have 2 seconds to attract attention, the first 2 words are crucial, and your readers should want to open your email today (2day). Your subject line is the most important element of your email. It's how readers know that they should open your email right away. Without a sense of urgency (or a reputation for outstanding content), readers have no compelling reason to stop whatever they're doing and read your email. If you're already using a newsletter or planning on starting one soon, you need to be aware of CASL, the Canadian Anti-Spam Law. In summary, the law requires you to receive consent for email newsetter opt-ins. The consent should be expressed (as in clicking a box in a signup form). Implied consent is okay too, but it's better to receive expressed consent. After it comes into effect, the law requires that you get expressed consent from all subscribers within the next 3 years. I'll get around to writing a summary of the law as it affects businesses who send email newsletters in the next few weeks, but keep this in mind as you reflect on your newsletter practices. My clearest takeaway from this session was that email is a way to get heard, while social media is a way to get shared. A newsletter is more intimate, and ultimately more effective, than just posting on Facebook or Twitter. Speaking of newsletter, you can subscribe to ours right here, and receive exclusive content that you won't see on our blog every 2 weeks. This year's Social Media Camp wrapped up on Saturday, May 3rd, but I'm still pretty excited about everything that I heard and learned during those busy 2 days. 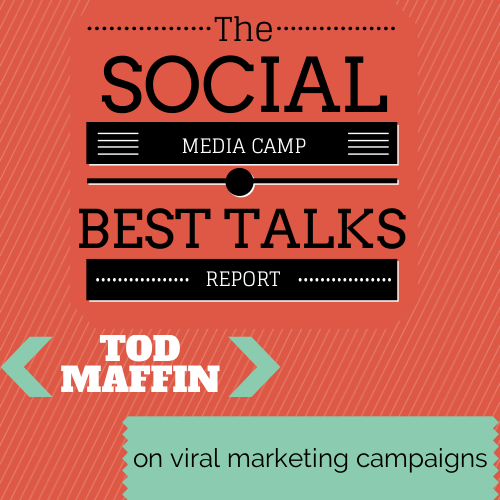 In our first post of the Social Media Camp Report, I'll cover the opening keynote by Tod Maffin. It was funny and entertaining, pretty much the best way to start a conference. Mr. Maffin talked to us about the 6 elements of a viral marketing campaign with plenty of videos and examples to show us. Here's the most important information I gathered from the talk. Marketing is a delicate balance between finding your audience, delivering what they want and getting them to act. So matching the three is very important if you want a campaign to go viral. If one of the elements is off (like using hip hop to market to middle-aged adults, or asking teenagers to buy a product they can't afford), then your campaign isn't likely to be shared. Viral campaigns are usually pretty simple. There's no complicated plot line, no deep character development. It's dancing, or singing, or kicking a ball, or a double rainbow. Don't overthink your concept and keep it simple. According to Tod (and other experts), there are only 3 tones that work in viral campaigns: silly, serious and stunning. Something else might work on a smaller scale, but if you're after viral, stick to these three. Having a video that's funny isn't enough anymore–companies should offer incentives for sharing. Everyone is a little bit greedy, and it's nice to be rewarded for our actions. Contests are great because they encourage regular and wide sharing, but make sure that the winner is chosen by your company, not by the public. Otherwise, you might end up with a Mr. Splashy Pants situation. If you campaign goes viral, people are likely to latch unto it and make it their own. They're going to remix it, reuse it and adapt it. The smart thing to do is embrace the movement; sending lawyers will only make people angry. You can't control what people do, but you can certainly take advantage of the opportunities that the web's creative freedom provides. Be ready to have a second and third campaign to follow up on the first. Don't let your viral campaign die from neglect; up the ante with every successive round. If you're successful, your brand or product awareness will soar to amazing new heights. This talk showed me that viral campaigns can be planned to a certain extent. These steps can't guarantee a viral campaign, but they can certainly increase your odds. If you have an idea for a viral campaign and would like help implementing it, contact us with your thoughts. You can also subscribe to our newsletter for exclusive content right into your inbox every 2 weeks. Two days, 8 workshops, 30 sessions and a deliciously embarrassing amount of Wannawafels later, the 2nd annual Social Media Camp has come to a close. This year saw over 650 participants, almost 200 more than last year. Sunday, October 3, was the first ever Social Media Camp here in Victoria, held at the Victoria Conference Centre. Almost 500 people attended and there were some amazing speakers from all over the continent.